HELMHOLTZ – Smart Food: Is It Fresh? Worldwide, 30 to 40% of all food is wasted. In the EU that food waste amounts to about 180 kg per person annually. Such food waste is not only unethical but also economically damaging, impacting each European household with ~1000€/year of losses. Up to 50% of that waste is caused by the misinterpretation of the expiration dates and can be avoided. Food is often still fresh and consumable past this date but disposed of anyhow. Innovation: The Julich Centre, EARTO member through Helmholtz tackeled that challenge with the Is-It-Fresh technology. 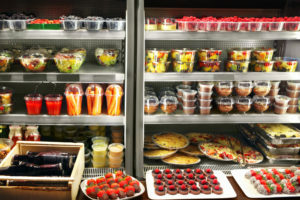 A printed ultra-low cost sensor technology, makes food packaging smart by measuring the product freshness via temperature, pH, humidity and other parameters and predicting the expiration date of the product based on these freshness parameters. A freshtag is integrated into the package and communicates wirelessly so that consumers can monitor the product freshness in real time through their smartphone or smart fridges. Impact expected: The digitalization of the packaging industry will stop the enormous wastage of food in order of millions of tons by equipping products with freshtags. We estimate that up to 69 % of the food packaging market or 2 trillion units are accessible to wireless freshtags. By integrating a chip into each package, it will also be possible to track a package and verify its origin, location and freshness history. Helmholtz is Germany’s largest scientific organization. It represents more than 38 000 employees working in 18 research centres across Germany. FZJ conducts research to provide comprehensive solutions to the grand challenges facing society in the fields of energy and environment, information and brain research. Our aim is to lay the foundation for the key technologies of tomorrow.